One person has died and another remains missing after an unmanned boat was found spinning in circles off the Half Moon Bay coast Sunday afternoon. The U.S. Coast Guard on Monday announced that the search for the missing boater, identified as Tuan "Tom" Tran, has been suspended indefinitely. The 17-foot vessel was spotted early Sunday afternoon spinning in tight circles about a quarter of a mile away from shore and roughly eight miles south of Pillar Point Harbor, according to the Coast Guard. An unresponsive person was later pulled from the water, according to the San Mateo County Sheriff's Department, but Coast Guard officials received word that two people, including Tran, were on the boat, which was eventually recovered and pulled to shore. 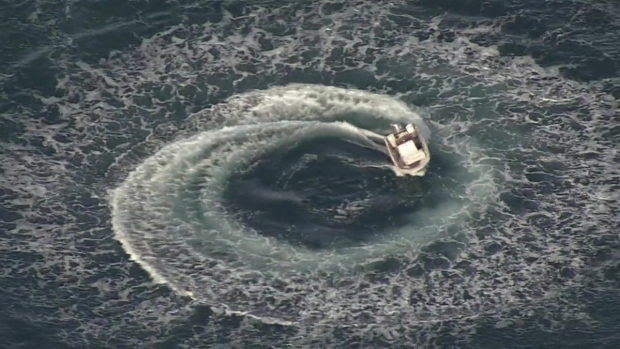 An abandoned boat was captured spinning in circles off the coast of Half Moon Bay Sunday afternoon. Crews combed the water for hours on Sunday and Monday morning before putting a halt to the effort, according to the Coast Guard. The identity of the dead person was not provided. There were no wounds to the body and therefore nothing indicating a suspicious circumstance, according to the San Mateo County Sheriff's Department. It is not clear what caused the boat to spin in circles, according to the Coast Guard. An investigation is ongoing. Anyone with information regarding Tran's whereabouts should contact Coast Guard Sector San Francisco watchstanders at 415-399-3451.